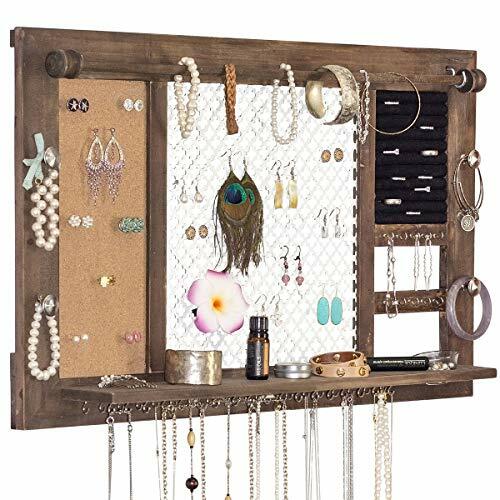 The SoCal Buttercup Deluxe Jewelry Shelf is the ultimate hanging jewelry organizer. It is twice the size of our standard organizers to offer even more storage space for your jewelry collection. It is ready to store hundreds of jewelry pieces, keeping them tangle-free and ready for easy access! Made of high quality wood with a rustic finish. The Deluxe Jewelry Shelf includes wall mount screws that make installation a breeze. No Assembly required. - Removable bracelet bar to easily store dozens of bracelets and bangles. - Metal mesh to keep hook earring pairs together. - Corkboard to keep stud earring pairs together. - Accessory shelf to store and organize nail polish, perfume, hair clips, etc. - Glass bowl for the smallest pieces. Never again lose your earring backs, charms, or other small items. - Two rows of 18 hooks along the bottom. No more tangled necklaces. Measures 28" wide and 16" inches tall.